Sixers center Joel Embiid shoots the basketball against the New Orleans Pelicans on Friday, February 9, 2018 in Philadelphia. 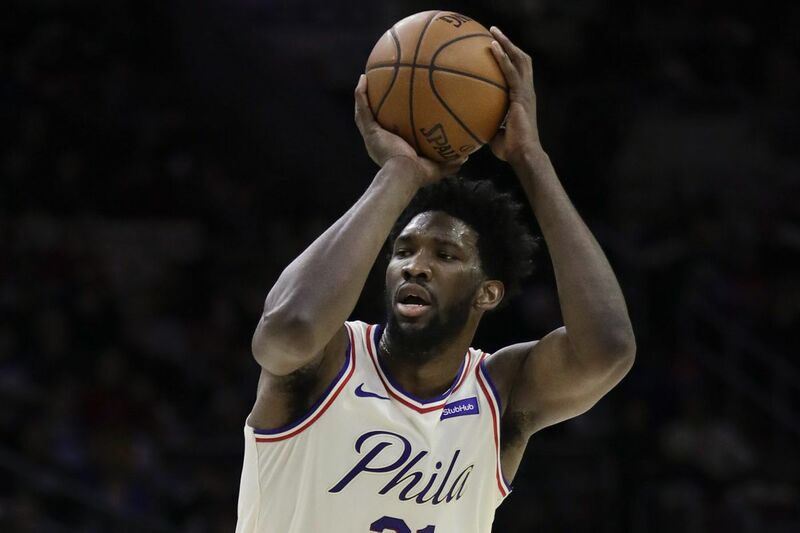 LOS ANGELES – Joel Embiid reached the second round of Saturday night's NBA Skills Challenge at the Staples Center. The 76ers center was defeated by eventual runner-up Lauri Markkanen of the Chicago Bulls. The Brooklyn Nets' Spencer Dinnwiddie won the event. The Skills Challenge — tests in ball-handling, passing and shooting — had eight participants, and the players raced head-to-head on an identical course at each end of the floor. The winners of the four first-round matchups moved onto the semifinal round. The semifinal winners then advanced to the final, which Dinnwiddie won over Markkanen. The Skills Competition was part of the NBA's All-Star Saturday Night, which also featured the three-point contest and slam dunk competition. Phoenix Suns guard Devin Booker won the three-point contest. Utah Jazz guard Donovan Mitchell won the dunk contest. Cleveland Cavaliers all-star LeBron James commented Saturday about remarks Fox News Channel host Laura Ingraham made earlier last week regarding players commenting about politics. Ingraham said James should "shut up and dribble" in response to his saying that President Trump doesn't "give a [expletive] about people." "I would not just shut up and dribble," James said Saturday, "because I mean too much to my two boys here, their best friend right here, my daughter that's at home, my wife, my family and all these other kids that look up to me for inspiration, who are trying to find a way out, finding some leeway on how they can become as great as they can be and how those dreams can become a reality." NBA commissioner Adam Silver said he's "incredibly proud" of players for using their platform to speak out on issues important to them. "I should also say it's not lost on me or anybody in this room that there is enormous amount of racial tension in this country," Silver said. "Enormous amount of social injustice, and I do see a role for this league in addressing those issues."